We have a qualified and experienced teacher, Chris Davey, who is always happy to talk through your programme to ensure your visit is meeting your needs, so feel free to give him a call to discuss your requirements: (03) 343-9517. We are keen to meet your curriculum needs. If our programmes don’t quite match your required specific learning outcomes we are happy to adapt them or create a tailored programme for you. 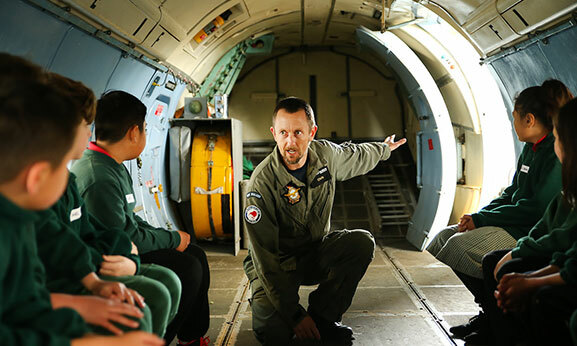 Examples of additional learning areas that we have covered for recent school visits are: the RNZAF in Antarctica, Exhibition Design, Fashion at War, War and Aviation, Children at War, Heroes and Pride, and ANZAC Day. Students with special needs and abilities can also be catered for, including English language students. Education programmes at the Air Force Museum are enhanced through the use of our own interactive classroom and simulator rooms. These learning environments are not accessible to the general public and will allow your students to participate in hands-on learning experiences that are not available anywhere else in New Zealand. Whether your students are learning about flight in the classroom, experiencing a realistic bombing raid in the World War Two Pacific Islands simulator room, or learning about survival at sea in our interactive life raft, they are sure to have a life-long learning experience they will not forget. Find out all you need to know about planning your education group visit to the Air Force Museum. We offer a broad range of primary education programmes, all closely linked to and designed for the New Zealand School Curriculum. We offer a diverse and unique set of resources for secondary school teachers and students.